Some months ago, I was speaking to Paul Clarke (@paul_clarke) about his role on the Mayor’s Digital Advisory Board and what they were doing with public transport data. Specifically I asked “when will I be able to see how long it is until my bus turns up via my mobile?”. What I was after was a mobile version of those bus countdown screens that are located at some major stops in London. He teased me at the time by saying “watch this space”. Little did I know, a few weeks later, the beta version of the TFL countdown site was launched. I extensively tested the beta service and saw it move into a live service a few weeks ago with some extensive publicity. The service is nothing short of brilliant, and it is super simple to use. Each and every bus stop now has a fairly prominent sticker on the bus stop pole (example below) which asks you to send a code to the SMS bus service (87287). Instantly, the SMS version of the service sends back the next few buses due at that stop. There is of course a mobile version, and it even allows you the option to show stops near you by geo-locating your phone (with your permission of course). In testing the service, I can only assume that it does take a live feed from the TFL bus positioning system that feeds the exact GPS position of each bus into a central server. I say this because the service has been super accurate. 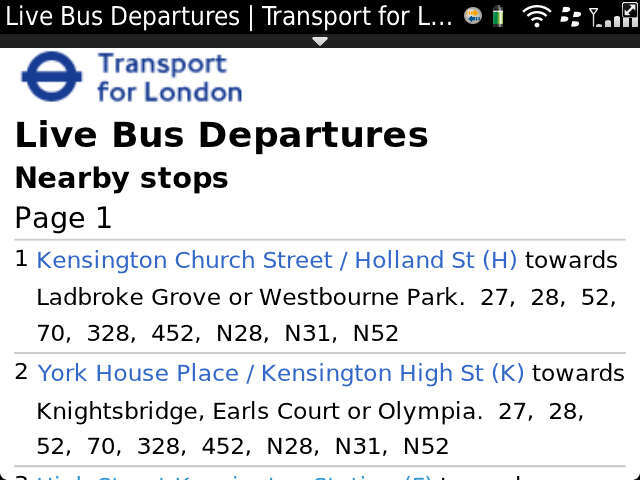 If it says the bus is “due” then I can normally see it approaching. When I have seen a bus stuck in traffic or roadworks, the arrival time updates in real time. Not only is this a somewhat simple use of technology (exposing a huge live database of bus locations and routes to an SMS or mobile site interface), it has saved me time and frustration on nearly a daily basis. When racing to get Miss 5, @madeleinegrill off to school via bus (we are a 3 minute walk from the nearest direct bus to school), I can pull up my own bookmarked list of frequently used stations and see if we should race to the stop or take it easy. I use the service so often I have even set up my own bus arrivals portal with my most frequent stops in a list, with a link to the search page for stops I don’t visit regularly. You don’t need to do this, as the mobile site’s search engine lets you search via one of the following: street, postcode, route number or bus stop code and even shows you every bus stop on the route – so in just a few clicks you can get the live and real-time bus arrivals information you need. I use the service so that when packing up in my local Starbucks (right outside a bus stop), I can now look up how far the bus is away and quickly down my coffee, or drink it at a more leisurely pace depending on how far away my bus is. While there have been many posters around London about the new service, I don’t believe many travellers have yet latched onto the service and how easy it is to use. I even used the SMS lookup to demonstrate in a workshop to a client about mobile and social how a simple SMS <> database service could be used. Everyone in the group could immediately see how easy and simple it was to us, although none had heard of it, or knew what the stickers at the bus stops were all about. If you catch a bus in London on a regular or even infrequent basis, then the Transport for London Bus Countdown service is a must! More Governments around the world should look at launching their own version of this service – perfect if they already have a live feed of their bus fleet’s location. This service gets my mobile service of the year award for 2011! I’ve used it lots of times already, Andrew. I’m surprised that this service is not better known — and that the similar National Rail service is also relatively unknown (send “PMR to CTK” to 84950 to see the next departures from Peckham Rye to City Thameslink). I often use that to check that an infrequent connecting service at Peckham Rye hasn’t been cancelled or delayed before deciding which train from home to catch. Andrew – some of the English county councils have been doing this at bus stops for much longer than TFL. I certainly recall first using the service around 3 years ago outside of London – but nonetheless it’s a brilliantly simple service. London Calling “when is my bus due?” brilliant use of public data&outstanding use of mobile: http://t.co/aIWPR9tb via @AddThis #in Love it! MT @AndrewGrill: Can’t praise service enough: When’s my bus due? (London only) http://t.co/6xUwb2RH <London: next few mins. Rural: Tuesday? and create the config file as per wot he sez.